Blueberry muffins, blueberry cream pies, blueberry cheesecake, blueberry pancake, fresh moist blueberries….just reading the words is enough to evoke that summer-sweet, luscious tang and get your mouth watering. Everyone knows blueberries are delicious, but did you know they’re good for your health too? In fact, blueberries have been touted as the cure for a host of serious medical problems including urinary infections, diabetes, high cholesterol levels to Alzheimer’s and cancer. First let’s look at what exactly blueberries are. Blueberries are the fruit of flowering plants native to North America, now also grown in Australia, New Zealand and some South American countries such as Chile and Argentina. Blueberries are cultivated and picked wild. The blueberry season in North America tends to run from mid-May to September,depending on the latitude. The fruit is best enjoyed in season when the taste is at its peak and the nutritional value at its highest. 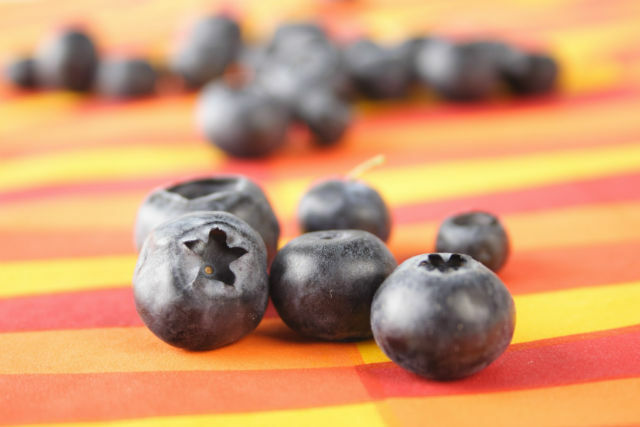 The dark blue berries can be enjoyed raw, or more commonly made into cookies, cakes, pies, scones, cereals, jellies and jams, and even pizzas. So what’s so special about blueberries? It could be said that the blueberry is a nutritional powerhouse. Blueberries are are a rich source of vitamin C, vitamin A, potassium, folate, iron, manganese and vitamin K. And 140 grams of fresh blueberries contain three grams of the dietary fiber that’s so good for your digestive system. But the main benefits of blueberries come from the anti-oxidants they contain in the form of bioflavonoids. Antioxidants are important for their ability to neutralize free radicals. When our body processes oxygen, free radicals are produced as by-products. These are highly-volatile substances that can damage our cells and are thought to be responsible for aging and a host of degenerative diseases. Fortunately, substances known as anti-oxidants found in fruits and vegetables work to neutralize free radicals and reduce their potency. Better known bioflavonoids include hesperidin and rutin and the anthocyanins. Blueberries are especially rich in anthocyanins. They give blueberries their deep blue hue and offer a range of beneficial properties. For one thing, they’re anti-inflammatory and protect large and small blood vessels from oxidative damage. This can protect blood vessels from damage caused by high blood-sugar levels in diabetics. This is especially important for the blood vessels in the eyes. Researchers have shown that the anthocyanins in blueberries, along with other agents such as proanthocyanidins, flavonols and tannins, inhibit mechanisms of cancer cell development in vitro. And one of the more exciting findings about blueberries is that they can help arrest the mental decline that occurs with Alzheimer’s Disease. So what’s the best way to get your dose of blueberries? Eating them raw is best but this is not always convenient. Fortunately, there are many ways to prepare blueberries that helps bring out their delightful flavor to its best advantage. The most popular is you can also make the old fashioned Blueberry pie just like your grandma used to make. The herbs cinnamon and mace compliment the taste of the blueberries and the result is delightful. It’s just one of many ways to incorporate blueberries into your diet. So make blueberries a part of your diet. Not only will you have a delicious new taste in your life, but you’ll also be doing your health a world of good. Search out some Blueberry recipes online that show you new and exciting ways to incorporate the blueberry experience into you life. Leslie Gilmour Cooks and writes about various dishes for various web sites. Hey Buddy!, I found this information for you: "The Magic of Blueberries – Sweet, Juicy and Good for your Health". Here is the website link: https://www.thealternativedaily.com/the-magic-of-blueberries-sweet-juicy-and-good-for-your-health/. Thank you.